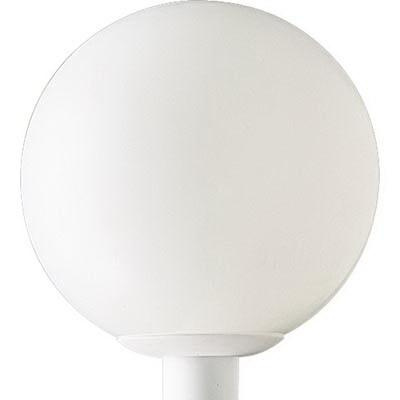 Progress Lighting Acrylic Globe Collection Contemporary/modern style post lantern in white finish, features polycarbonate construction and white shatter-resistant acrylic globe shade. This complete post lantern accommodates one 100-Watt incandescent lamp that has medium based socket. Lamp with diffuser, has voltage rating of 120-Volts. It measures 12-Inch x 13-Inch. This post lantern with 6-Inch long lead wire, features post-top fitter for 3-Inch post/pedestal mounting. It is suitable for outdoor lighting. Lantern UL listed.